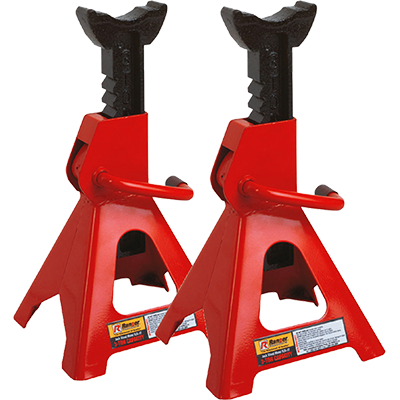 When used together, these heavy-duty jack stands will safely support up to 3 tons (2.7-mt). The rugged ratchet ladder audibly snaps into a secure hold. At each ratchet point, a slender but powerful pawl is over-engineered to easily accommodate the rated lift capacity. Before you slide underneath a vehicle, make sure your load is sitting on a pair of Ranger jack stands. These stands will keep up to 2,721 kg worth of vehicle off the ground, but what's more important is that they are designed to protect you, the most precious “equipment” in the world. That's why all Ranger jack stands are constructed out of welded steel and feature a ratchet and pin safety design that remains locked under load. The release handle is only activated by a swift, deliberate upward thrust of the hand once the vehicle load has been eased off the stand with a car jack. Each pair of stands offers maximum operator protection. Furthermore, wide base construction increases surface area of the stand to promote better stability under heavy load. With a car resting on all four jack stands, there’s virtually no movement from the stands, even if bumped or kicked. Use these stands in pairs for automotive and fleet services, as well as agricultural and construction equipment service vehicles. If your vehicle features a pinch-rail or frame lifting points near the wheels, be sure to grab a full set of four. There’s no such thing as overboard when it comes to safety, which is why each stand we offer is over-engineered far past its rated load. Correctly use your Ranger jack stand on a daily or every once in a while, and it’ll be your best friend for life. Of course, a single stand can be used to change a tyre or perform quick wheel service on just one side of your vehicle, lifting one wheel at a time. However you choose to work, if you’re going to work under jack stands, Ranger stands are the only jacking tools you will ever need. Need to hold something heavier? Consider Ranger’s RJS-6T 6-ton heavy-duty jack stand.